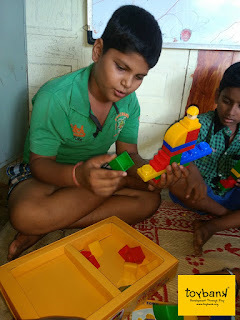 Toybank partners with the Social Service League in Mumbai! Toybank Mumbai partnered with Social Service League of Xavier's College this month to provide them toys for Project Care. On the 12th of Dec Toybankers and SSLites got together to distribute toys to 100 children from Navjeevan Society and Dolors School. 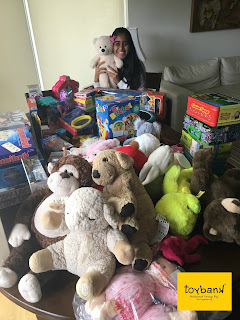 "I came to know about Toybank through a friend and happened to attend one of their events at St. Xavier’s College. When I reached the venue I saw all youngsters and kids dancing and enjoying. There was so much of enthusiasm all around. There were kids from a school and from an NGO day-care centre who had been brought to the college since morning for a day of ‘dhamaal masti’. I later realized that each child was taken care of by an individual volunteer and there were quite a lot of them! The volunteers all college going youngsters and some even teenagers looked after one child assigned to them, took care of their bags, food, clothes etc. What was even more heartening was that the children had taken a liking to their guardians and were so comfortable with them. The children and the youngsters just seemed to love each other so much. While going back in the evening, I saw that each child was given a nicely wrapped toy according to his age. These youngsters had organized each and every aspect of the event themselves and had done a very decent job. Most importantly, they had managed to make those less fortunate kids so happy even if it was for a day. Keep up the good work guys"
Catch all the masti here!